MADE MURKY WITH THE WEARING OF YEARS. KEEP SECRETS THAT HARDER MATTER CANNOT. 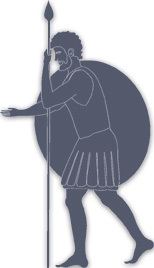 "The Laviniad is a truly unique work; the story is unique and the book itself is unique....The author successfully writes in the style of the ancient epic in modern English. Lovers of classic tales will really appreciate the poetry and the plot. 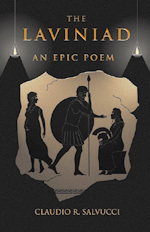 The poem reads easily and naturally with the flow and flavor of the ancient epics. A complete glossary in the back will help anyone who has not read the Aeneid or the Iliad to understand the relationship of the characters and the various names of the Greeks, Trojans, and Latins....It is a beautiful, elegant edition, wonderful for gift giving." "...the poem manifests a genuinely classical feel, even as it remains couched comfortably inside a vernacular with which the modern reader is perfectly comfortable. On top of this, The Laviniad sports some finely written passages and is simply a very involving and moving story." The ancient muse of the golden age of Roman literature has stirred once more, this time within the mind of Claudio Salvucci, native of Philadelphia, Pennsylvania but with roots that extend back to his ancestral home in ancient Latium. A student of the classics from his earliest years, the author has crafted a work which builds upon the fragmentary record of the founding of Lavinium left us by Livy, Dionysius of Halicarnassus and others; all the while giving an obvious nod towards his Vergilian mentor. Drawing not only from the classical tradition but also from alliterative Anglo-Saxon poetry and classical translations, the author has managed to craft an epic style in modern-day English which is both musical and majestic. Set in ancient Italy, The Laviniad picks up the tale following the death of Aeneas, when his young son Ascanius is thrust to the fore as leader of the Trojan remnant in Italy. Following the trials of this youth in the face of his hostile Italian neighbors, the author spins his enthralling yarn with tight, compelling poetry. To read an excerpt from The Laviniad, click here. The Laviniad was originally released as an elegant, handmade hardcover edition. The text was set in distinctive Roman capitals designed especially for the book, and printed on parchment for an appropriately ancient look. The leaves were sewn together by hand and the outside is bound in 100% cloth. A very limited number of this attractive edition remain for sale. As of May 2005, a new paperback edition of The Laviniad was released, featuring a new full-color cover. About the Author: Claudio R. Salvucci is a writer of various genres who resides in Bucks County, Pennsylvania. Aside from his literary work, Mr. Salvucci has penned several books on Philadelphia and Pennsylvania dialects and edits the American Language Reprint (ALR) series and the Annals of Colonial North America (ANCA) series for Evolution Publishing. For further information about this author, please click here. A bright young zoology professor arrives at a prestigious Long Island college filled with jaded, materialistic scientists. But in a tower high above their heads, the college's angelic heiress devotedly watches over a collection of handmade animals made of a more mysterious stuff than cloth and string. A tribute to the works of Nathaniel Hawthorne, The Menagerie of Marsepink is a moral allegory on the limits of natural science and the supernatural reality of the soul. Now available in paperback, this short story successfully captures the atmosphere and charm which characterize the works of the great 19th century scribe. To order The Laviniad in paperback with a 10% discount using a credit card, click the button below. To order The Laviniad in deluxe hardcover with a 10% discount using a credit card, click the button below. 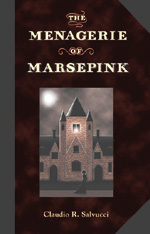 To order The Menagerie of Marsepink in paperback with a 10% discount using a credit card, click the button below. Order The Laviniad and The Menagerie of Marsepink by Claudio R. Salvucci together and save even more!